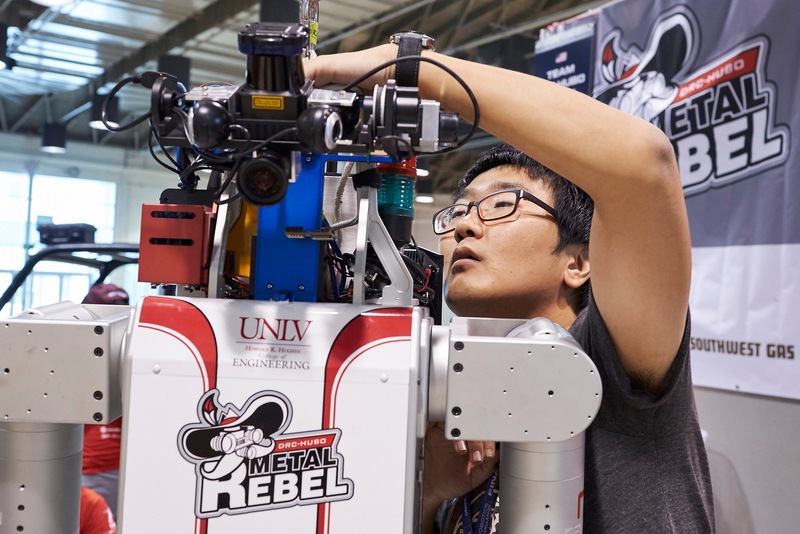 UNLV was among 23 of the world’s best robotics teams competing in the 2015 U.S. Defense Advanced Research Projects Agency (DARPA) Challenge Finals, an elite competition of robots and their human supervisors, on June 5-6 at the Fairplex in Pomona, California. Launched in response to a humanitarian need that became glaringly clear during the nuclear disaster at Fukushima, Japan, in 2011, the DARPA Robotics Challenge consisted of three increasingly demanding competitions over two years. The goal was to accelerate progress in robotics and hasten the day when robots can enter areas too dangerous for humans and mitigate the impacts of natural or man-made disasters. The team was led by Paul Oh, Lincy Professor of Unmanned Autonomous Systems. During the competition, Oh and members of the team were featured in Computer World, U.S. News & World Report, Popular Science, and more. “On behalf of Dean Rama Venkat, the Howard R. Hughes College of Engineering is proud to announce that our team DRC-Hubo @UNLV finished in eighth place among the world’s best robotics teams competing in the 2015 U.S. Defense Advanced Research Projects Agency (DARPA) Challenge Finals, just a few points below universities such as Carnegie Melon and MIT,” Megan Downs, Director of Communications at Howard R. Hughes College of Engineering, told supporters. Take a look at this UNLV slideshow which highlights some of the most exciting aspects of the competition.